• Details on how the delta came into being, why the delta developed, what the area was like before the “Sea of Sand” succeeded to cross the river and why the river and the dunes are the reasons for existence for the underground fresh water aquifer. • Details on the formation of Sandwich Harbour and Walvis Bay. • Scientific information on the underground fresh water aquifer and why it is endangered by modern man. • Visiting different kind of dunes that exist in the delta and detailed explanations of how the different shapes are formed, how much they move in a given time and what the gradient of a slip face is and why it never differs. • Details and evidence of why the dunes have different colours. • Evidence of five different stages as a dune moves over a tree as well as over a Narra plant. • Examining the desert fruit, the !Nara and the Sirub, explaining how the plants adapted to this particularly harsh environment, sampling what the fruit tastes like (in season) and how it is harvested and used by the Topnaars (ancient local inhabitants claiming to be a tribe of the Khoi-Khoin) as well as by the animals. • Details about the present animals (jackal, elephant shrew, oryx), birds (pale chanting goshawk, dune lark (endemic) & Damara tern (endemic)), reptiles (snakes & lizards) and some of the insects that live in the delta. Sometimes we are able to show them some of these living creatures. • Visit and explore the different intact Topnaar middens (old living places). • View what these ancient inhabitants of Namibia ate, used as tools/implements and as body ornaments. • Show physical evidence of petrified tracks of the Topnaars and their goats. • Show centuries-old ostrich eggshells that was used by the Topnaars to keep water in and was preserved being covered by dune sand all the time. • We also show them numerous petrified tracks of almost all the present land animals of Namibia e.g. Elephant, rhino, buffalo, eland, oryx, kudu, giraffe, baboon, cheetah, steenbok, etc. The three hour tour is done on fully automatic quad bikes and is suitable for the rider with no previous experience, even for children and healthy elderly people. Although this quad tour differs vastly from the “dune bashing tours” offered by all other quad bike operators at the Namibian coast, it gives the riders lots of fun to drive their own quads in the dunes and to safely play a little, if they so wish. The wearing of safety helmets is compulsory. The tours are done usually in the mornings only, because of prevailing winds, but the weather permitting, tours are also done in the afternoons. Soft drinks are included. This tour incorporates some sites of the Historian Dune Tour, but is for the more energetic. This tour is not suitable for children or older people as it is more challenging and more difficult than the 3 hour tour. It entails a lot of hard driving! This longer tour drives up to and crosses the main Kuiseb River, at the place where it broke through the dunes in the year 2000. This tour reaches the edge of the Sea of Sand, where it turns around and follows a different route back. • Evidence of five different stages as a dune moves over a tree as well as over a Nara plant. • Examining the desert fruit, the !Nara, explaining how the plants adapted to this particularly harsh environment, sampling what the fruit tastes like (in season) and how it is harvested and used by the Topnaars (ancient local inhabitants and a tribe of the Khoi-Khoin) as well as by the animals. • We also show them numerous petrified tracks of almost all the present land animals of Namibia e.g. Elephant, rhino, buffalo, eland, oryx, kudu, giraffe, baboon, cheetah, steenbok, etc. 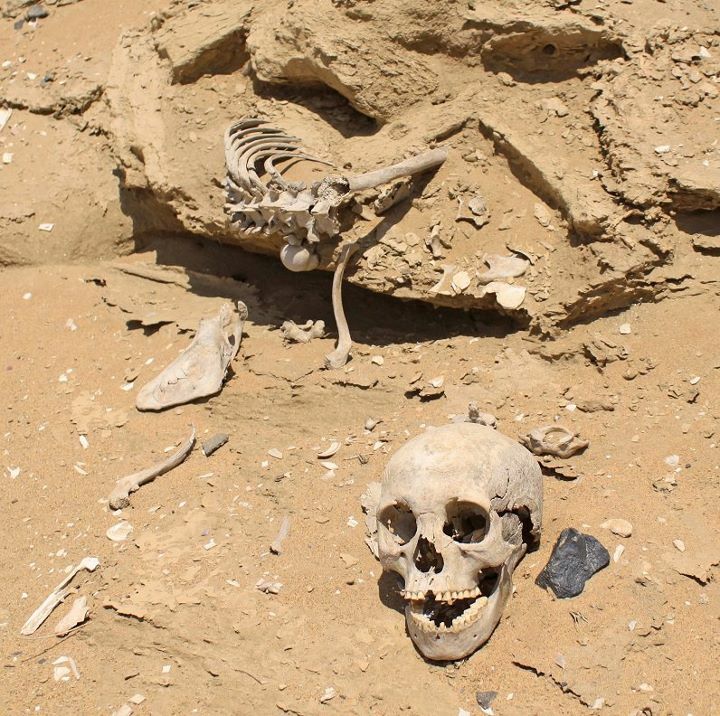 • Lastly, visitors are shown amazing evidence why the Namibian coast is called the “Skeleton Coast”. The wearing of safety helmets and the signing of an indemnity are compulsory. The tours are done usually in the mornings only, because of prevailing winds, but the weather permitting, tours are also done in the afternoons. Soft drinks are included. 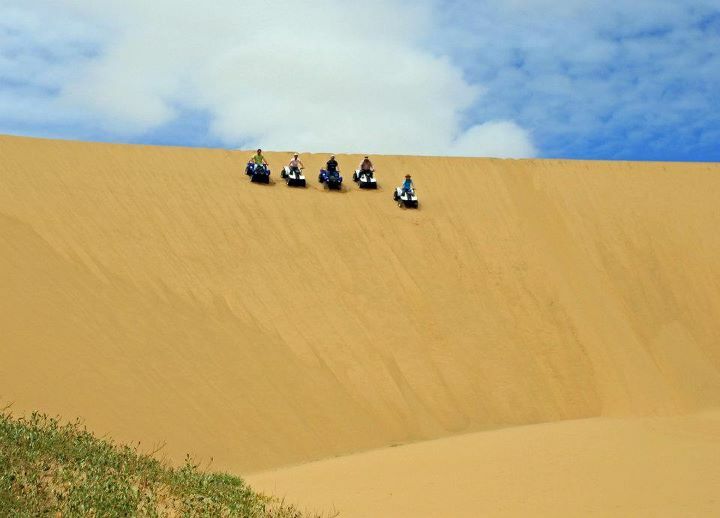 Kuiseb Delta Adventures is extending their famous Historian tour by offering an exciting one day quad tour into the red dunes of the Sea of Sand as well as through the yellow dunes of the Kuiseb delta. Prior to entering the dunes, advanced training will be given to enable you to drive the quad bikes with confidence through the dunes. 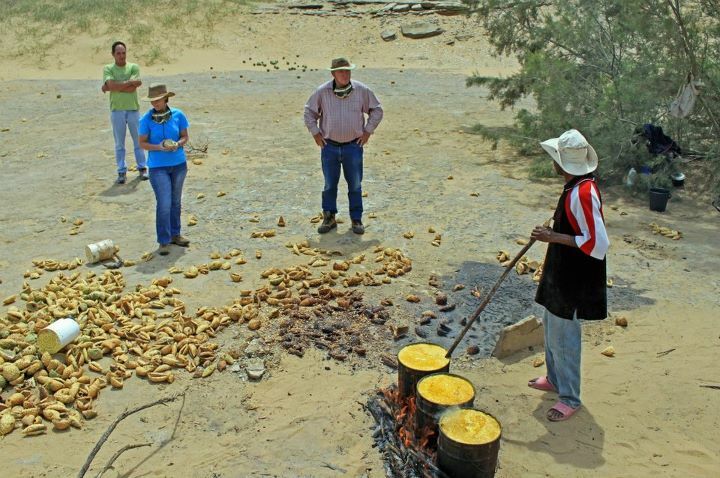 The tour departs in the early morning from Rooibank, 35 kilometers from Walvis Bay, where after you will visit a Topnaar settlement, cross the Kuiseb river (which is normally a dry river bed) and enter the gigantic RED DUNES, which reach up to 1000 feet, into the southern border of the SEA OF SAND. The change in the landscape is extremely dramatic. The dunes are GIGANTIC and RED. There is no vegetation in this barren, lonely desert. One very seldom sees any sign of civilization, except for a borehole rusted almost to extinction. The area is very deserted and except for your fellow riders you will not see any other signs of human habitation. Peace and tranquility. It is fantastic – no people, no noise, no pollution – only you and your group navigating by GPS through these fantastic sea of dunes. 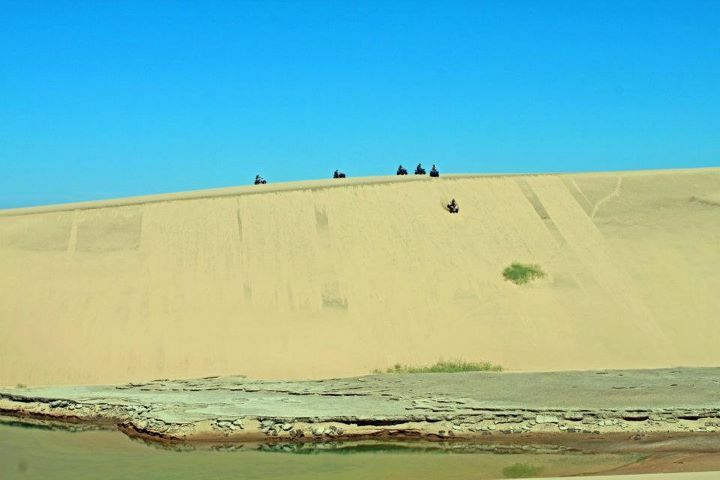 The tour visit old elephant tracks between the dunes, where after it proceeds deeper into the Sea of Sand on a long circular route through the dunes until you reach and cross the Kuiseb river again and enter the delta. Once again, you marvel at the sudden change of the scenery and the different colour of the dunes that are now yellow. A person taking part in this tour, must obtain and provide proof of insurance which insurance includes medical evacuation by air, if necessary. Bookings must be done well in advance. A group must consist of a minimum of 6 and a maximum of 10 people. We have extended our famous Historian tour by offering an exciting overnight quad tour into the red dunes of the sea of sand. The tour departs from Lagoon Chalets in Walvis Bay in the early morning and proceeds to the yellow dunes of the Kuiseb Delta. It follows the route of the Historian tour until it proceeds to and crosses the main branch of the Kuiseb river, eventually entering the 1000 feet RED DUNES on the southern border of the SEA OF SAND. The tour continues through the Sea of Sand to the overnight base camp at Rooibank on the Kuiseb River. Rooibank will serve as the base from where the tour proceeds to the Topnaar settlements as well as a late afternoon photographic excursion into the SEA OF SAND. After reaching the most southerly point of the famous Historian tour, the tour continues south to the Kuiseb River and upon crossing the river (which is normally a dry river bed) enters into the Red Dunes. The change in landscape is extremely dramatic. The dunes are GIGANTIC and RED. There is no vegetation in this barren, lonely desert. One very seldom sees any signs of civilization except for a Borehole rusted almost to extinction. 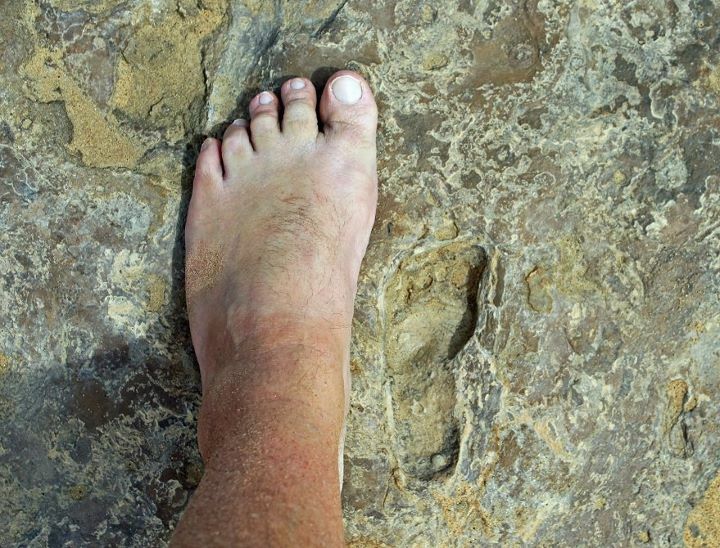 You visit fossil elephant tracks in an old riverbed between these high dunes. The area is totally deserted and besides other members on the tour, you will not see any other forms of human inhabitants. Peace and tranquility. It is fantastic- no people, no noise, no pollution- only you and your quad train navigating by GPS through these fantastic dunes. The tour arrives at the base camp destination at about midday where you can hop into a bath or shower to wash off the desert sand and enjoy a light meal. Afterwards you can relax in house, sleep or sun tan (even during winter!!). In the late afternoon you can travel up the Kuiseb River towards the Topnaar settlements where you will meet the descendants of these ancient people and experience how they live today with their herds of goats and basic means of raising crops to be able to feed themselves or alternatively you can stay at the base camp and just relax. From the Topnaar settlements you travel into the Red Dunes where the shades on the slip faces of the dunes in the late afternoon offer excellent photographic opportunities. On returning to the base camp, everyone can relax around an outdoor fire and partake in a traditional African barbeque. The stars are so clear in this unpolluted desert sky that stargazing and counting the satellites going by is a perfect way to end a day of amazing sights in the sea of sand, prior to retiring for the night all snugly in a nice clean bed, tired from the sun and fresh dry unpolluted air. After a hearty breakfast the quad tour crosses the river on a long trip into the Sea of Sand on a long circular route in the direction of the Kuiseb River, which you cross, continuing through the Delta until you reach Walvis Bay about midday, tired from the BEST QUAD BIKE EXCURSION IN THE WORLD. Bookings for this tour must be done well in advance. A group must consist of a minimum of 8 and a maximum of 10 people. The wearing of safety helmets and the signing of an indemnity is compulsory. Along with our regular tours, we also offer tailor-made tour packages which are put together according to your exact requirements, catering for your every need. 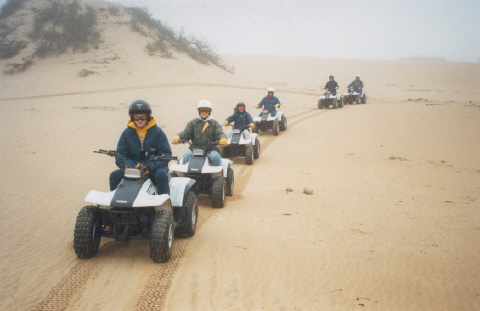 - Guided Quad bike excursions into the high dunes on your own bikes during off -season. - Self-catering cottage accommodation in the Kuiseb River on the edge of the Sea of Sand. 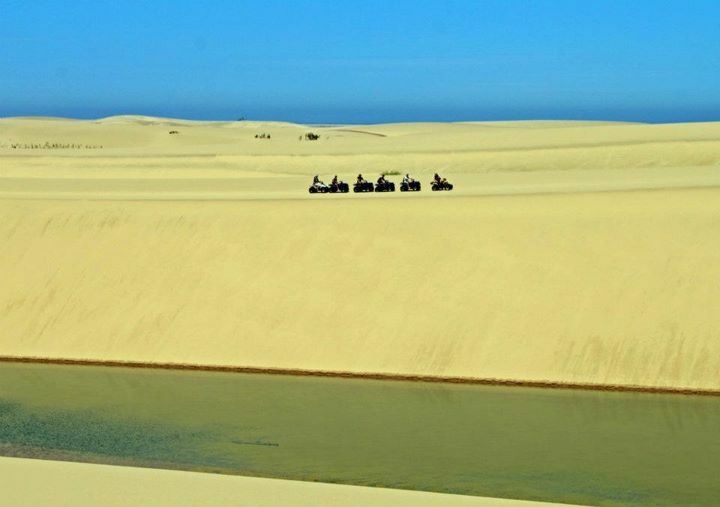 - Self-catering/catered rustic camp accommodation in the Kuiseb river on the edge of the Sea of sand. - Other accommodation in and around Walvis Bay. This tour is done with all-wheel drive vehicles with expert off-road drivers/tour guides, and start in Walvis Bay where we will stop at the lagoon to view the abundance of bird life, especially the abundance of flamingo’s. From there the tour proceed to the salt works where visitors can photograph this massive salt mountain that looks like an ice berg. We will drive through the vegetated plains of the Kuiseb delta where we sometimes see some of the animals of the delta, like springbok, ostriches or jackal, until we reached a dune with a view over the salt plains area of the delta. We proceed over these plains until we reach the beginning of the “Sea of Sand”, where it borders on the Atlantic Ocean. Now we continue southwards, on the beach, if the tide allow us, or through the dunes until we reach a point where no vehicle are allowed to cross. The visitors can proceed on foot southwards on the beach towards the lagoon of Sandwich Harbour or they can climb a high dune from where the will have a beautiful view over the sea, the dunes, the beach as well as the lagoon. Lunch will be served and out guests can relax or swim in the sea, the weather prevailing. After lunch, we drive for a while on the high dunes on the edge of the ocean with breathtaking views over the high dunes, the beach, and the ocean. This place is really spectacular and one of the tourism highlights of Namibia. A photographers dream! From the dunes we drive on a different route through the delta, back to Walvis Bay. Before we reach Walvis Bay, we drive onto a dune with a spectacular view over the salt pans in the receding rays of the sun. We take a last look over the delta, tired, but satisfied after an exciting and full day in a wonderful part of nature.